The Welsh Conservatives launched their manifesto with the key pledge of continuing to secure Britain and Wales’ economic recovery. The Prime Minister David Cameron, in his foreword set out their manifesto as a plan for every stage of a person’s life, while emphasising that all of this was dependent on a strong and growing economy. Other pledges included eliminating the deficit and running a surplus by 2020 along with a referendum on Britain’s membership of the EU. 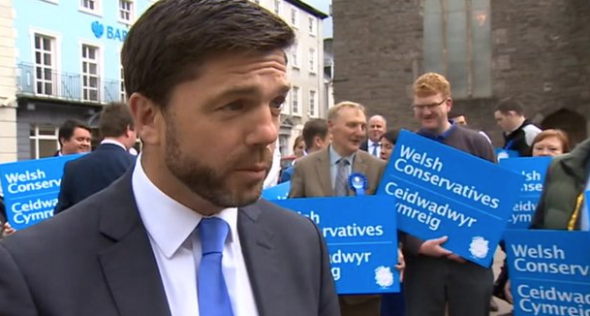 Seeking to shed the austerity image, the party pledged to legislate to keep people working 30 hours on the minimum wage out of tax and to increase the tax-free personal allowance to £12,500, which they said would benefit 1.4 million Welsh taxpayers. They also set out plans to increase spending on the NHS in Wales, fund schools directly and invest in rail upgrades and electrification. On immigration, in the main, the Tories pledged to make migrants wait four years before they can claim certain benefits, such as tax credits, Universal Credit, or get access to social housing. In terms of fair funding for Wales, the manifesto pledged to introduce a ‘funding floor’, once it had called a referendum on income tax powers in the next Parliament. This however received fierce criticism from Labour, with First Minister Carwyn Jones accusing the Tories of doing a complete u-turn on the issue of fair funding being linked to a referendum. The manifesto also sets out further commitments to devolve more power to the National Assembly including the Assembly name, size, electoral system, Assembly elections and voting age.